For the next several weeks, I am participating in an Overstock Scaveneger Hunt... each week I'm going to be checking out a set of clues to find another cool product from Overstock.com! This week's trail took me through Home and Garden, into the Kitchen and Dining area, to check out appliances, specifically... food processors and wow... with over 50 to choose from, Overstock.com has a Food Processor for everyone. 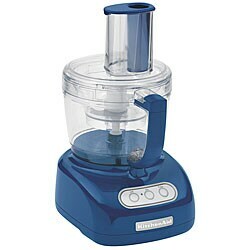 I personally have a food processor on my holiday wish list.. because I think it will come in incredibly handy when I start making Erik's baby food. but I'm not sure if that's because of the great features, or just because it's a cool blue color.. I really do want your opinion, so if you have time to leave me a comment, I'd appreciate it!